For those of us who also crave sensory stimulation, one of the big reasons that we travel, step out of our comfort zones, and go to concerts is to turn up the sensory dial on our own lives. On any given day, my sensory dial could be anywhere from a 1-5 on an amplifier. While traveling, pushing myself, or immersing myself in a concert vibe, my senses hover in the 5-11 range. While moving through space and time and experiencing a new place, everything is new. You notice the sounds, different smells, and see the sights of how people interact with each other. The same holds true while navigating a new job or challenging yourself in a physical, mental, emotional, or spiritual way. One of the easiest ways to step into sensory stimulation is by taking in live concerts and musical performances. The process of chasing these new sensations is intoxicating. I’ve heard that the highs associated with any new sensory activity can be replicated with illegal drugs, but I don’t care to find out. I’ll count myself lucky that traveling, challenging myself, and listening to a live performance makes me feel alive. It’s like taking my pulse through action. I can take my pulse and know that I’m technically living. But through these experiences, I feel like I am really LIVING. You know what I mean? In the last few days, weeks, and months, I’ve been experiencing long and protracted transitions. As previously mentioned, I am very stimulated by the fresh and new qualities and lesson that these changes have brought. They have also been wreaking havoc on my senses and physical body. I know this because my skin feels like tissue paper. Some of my normal go-to stress-relieving physical activities seem too exhausting and my body protests loudly if I do them. I have tiny hives that itch on my forearms. I’m not sleeping well. I go from one thing to another in my day with that sensation of “life is a test and you’re about to fail” that I talked about here last week. I’ve changed jobs, ended an academic teaching year, said several “goodbyes” and “see you laters” with my beloved family and friends which has been heart-wrenching. The celebrations have been many and I feel so very seen, loved, and held by my precious people. I’ve packed and moved which is exciting, soul-sucking, shame-inducing, and ego-bruising. Ego-bruising because while I think of myself as a minimalist without much stuff, that belief is incongruent while looking at a pile of my stuff in boxes. Shame-inducing because that pile of boxes is in someone else’s house. And I’m not done yet. There’s more transition to come. It’s all very exciting and sensorily stimulating. I haven’t had time to make sense of it all yet. As one of my great teachers says, “Life is happening through me”. My beloved neighbor hugged me goodbye today and said: “there’s no growth without loss”. Those I have left behind remind me that “we and this place will always be here”. These words have comforted me while I grieve the loss of easy access to my known and familiar human and location anchors such as my friends, the mountains, and the Pacific ocean. Did you see what she did there? She transitioned! With badassery, style, and grace. Before I hit record, she gave us all a Michael Jackson-esque dance solo. And in this 34-second video, she pivoted. She twirled – in sparkle tights. She took off her veil. She changed costumes. She let her one of her dancers set a mic. She dropped down, took a swig of water, and then like a champion, commanded our attention again with her swaggery dance moves. Then she moved on to the next thing. She blew my mind at that moment and then again hours later when I reflected on the work of this woman who advocates for freedom and love through her words, actions, and music. Ultimately we have control over how we show up in the world. And although I vowed to cancel all contracts that made me feel the need to be stressed out in times of transition, old habits die hard. I’m trying. I’m signed up for the long game of changing old and unproductive habits. 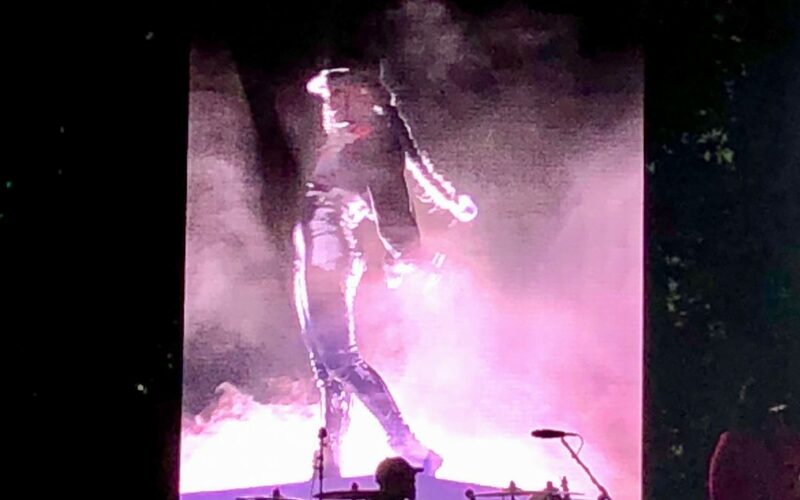 Janelle and her artistry inspire me and show me how I desire to show up: fully breathed, in sparkle tights, with a top hat, with killer dance moves while staying fully hydrated. Do any of you beauties have any sayings or tips for soothing yourself while in overwhelm? If so, please leave a comment and share some of the love. Watching this video of Janelle transitioning over and over has worked wonders on me.